Leslie Skimmings created this Musing and the watercolor illustration after dining in the Abenaki Room of the Common Man Restaurant in Plymouth, New Hampshire. Artifacts and old sepia photographs on clay-colored walls are among all things native and tribal. On the ceiling, an inverted canoe hangs above the long banquet table reserved for parties of twelve. Gilded frames hold soulful images, portraits of old warriors and women in ceremonial costume—a gallery of memories to remind diners of a once time-honored tribe whose ancient homeland is now the soil beneath our feet. All authentic Americans are they, whose neighbor tribes once did hunt and haunt dreamers of a new land. Little more than their legacy is left for us to know now. Dinner is served under watchful eyes. 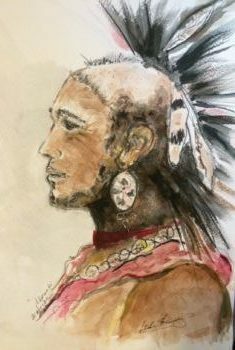 I look away and then meet again the young Abenaki woman who asks for an answer to a question that must have been always, “Why?” And a chieftain, sorrowful but resigned—looking still proud in his feather headdress—holds me accountable for the broken promises, the polluted rivers, and for all means of abuse of sacred land. I find myself in need of something sweet to counter the bitterness and the shame, but no offering of Indian pudding is on the menu. So I ask for the bill, instead, and wonder how I—and all my kind—can ever pay the debt. No answer comes. But I shall pray tonight that at another time and in another place these men and women might live in peace and travel rivers like the Penobscot, the Kennebec, and the Pemigewasset, or dwell, again, on the sheltered shores of Winnipesaukee and Squam. 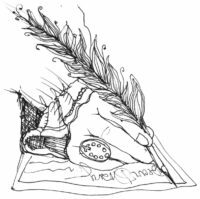 Leslie’s novel for middle-grade readers Discovery in Braxton Falls is due for publication in 2017. She can be reached by email at leslieskimmings2@gmail.com.